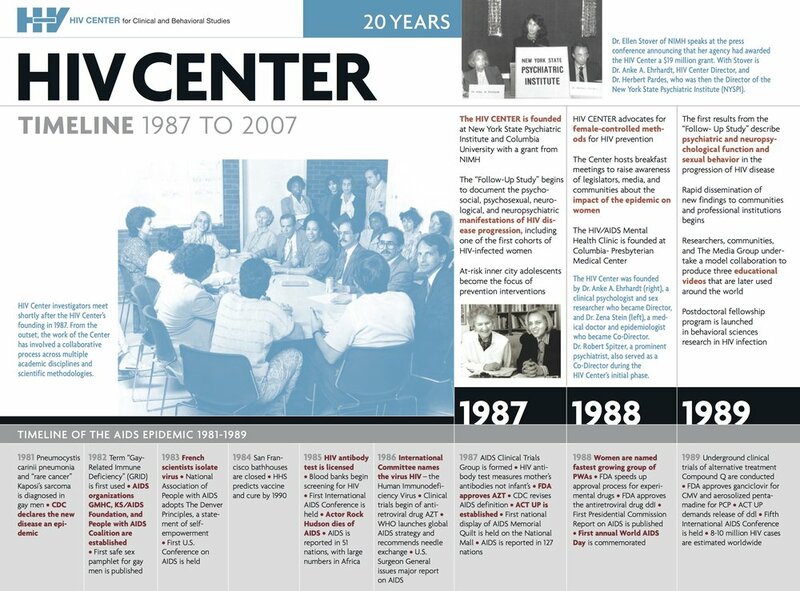 The five panels below provide an illustrated overview of the HIV Center's first 25 years of research, advocacy, training, and community engagement. On each panel, a parallel timeline presents major milestones in the AIDS epidemic itself, reflecting how the HIV Center has evolved in response to the changing nature of the epidemic. Development of the timeline was led by former HIV Center Director of Communications Raymond A. Smith, PhD. A large-scale version, along with a photo exhibition of images of global AIDS activism, are on permanent display at the HIV Center on the third floor of 722 West 168 St., the Rosenfield Building of the Columbia University Mailman School of Public Health. Click on panel to download PDF.